Cordula Enenkel was born in Stuttgart, Germany. 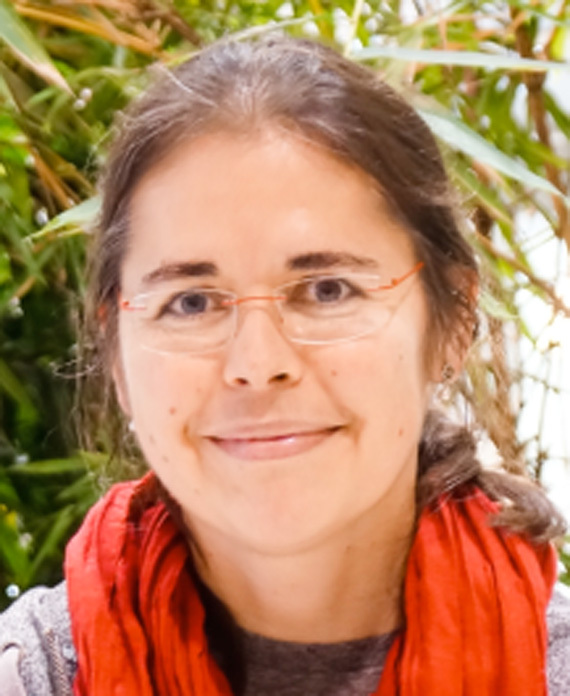 Since her PhD in Dieter H. Wolf’s laboratory at the University of Stuttgart she has been fascinated by the ubiquitin-proteasome system. She joined Günter Blobel’s laboratory as a post-doc at the Howard Hughes Medical Institute of the Rockefeller University in New York, where she investigated nuclear transport in yeast. In 1997 she moved to Berlin, Germany, and worked as a group leader and lecturer in the Institute of Biochemistry of the Humboldt University / Charité headed by Peter-Michael Kloetzel. In Berlin she discovered the nuclear import pathway of proteasomes and quality control pathways of proteasome assembly. In 2002 she became Privatdozent (Habilitation) in Biochemistry. In 2011 she moved her laboratory to Toronto. Acknowledgements: C.E. was supported by the Landesgraduierten-Förderung Baden-Württemberg, Thyssen Stiftung and German Research Foundation (DFG). Cordula Enenkel’s lab is welcoming national and international undergraduate and graduate students. Dr. Enenkel built a network of collaborations with national and international researchers from Israel, USA and Germany. Figure 1: Proteasome localization. Nuclear proteasomes in dividing yeast and human melanoma cells (left panels). Cytosolic proteasome granules in quiescent yeast and dendrites of rat neurons (right panel). For review see Enenkel, 2014. The proteasome, a conserved multi-subunit protease (Gu & Enenkel, 2014), is the key enzyme for the degradation of aberrant proteins. The proteasome core particle (CP) harbors the proteolytically active sites. The regulatory particle (RP) is responsible for the recognition of poly-ubiquitylated protein substrates. Impaired proteasomal proteolysis results in irreversible and immobile protein aggregates – typical features of neurodegenerative disorders (Enenkel, 2006). Our research focuses on the intracellular dynamics of proteasomes – one of the least understood topics in the proteasome field. Live cell imaging techniques monitoring GFP-labelled proteasomes in proliferating yeast and mammalian cancer cells suggest that proteasomes are primarily nuclear during cell division. Proteasomes are imported into the nucleus either as inactive precursor complexes or as holo-enzymes (Weberruss et al. 2013, Burcoglu et al. 2015). During the transition from proliferation to quiescence, mature proteasomes are exported from the nucleus into the cytoplasm and sequestered into motile and reversible droplet-like proteasome granules. In yeast, the presence of proteasome granules protects quiescent cells against stress and confers fitness during aging. Upon exit from quiescence proteasome granules resolve and proteasomes are rapidly imported into the nucleus to promote cell proliferation. 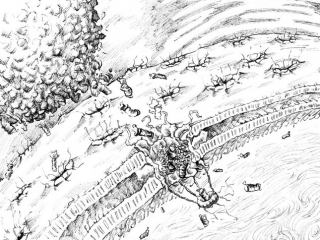 How proteasome granules are organized is a mystery in Cell Biology. We aim to understand the organization and function of these enigmatic structures. Using high-throughput imaging arrays in yeast and mass spectrometry of cross-linked proteasome granules, we discovered that proteasome granules are composed of proteasomes and free ubiquitin. 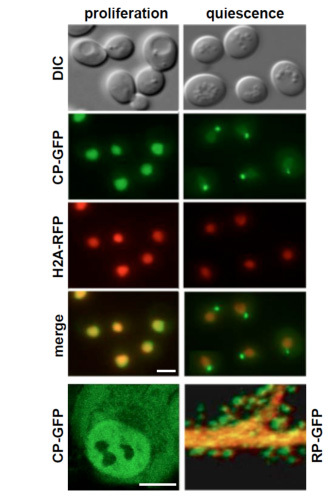 Based on our work in yeast we propose that proteasome holo-enzymes engaged in the degradation of poly-ubiquitylated proteins are mainly required in the nucleus of proliferating cells. During the transition from proliferation to quiescence, the levels of glucose and ATP decline. Proteasomes are exported to the cytoplasm, and CP and RP are stored together with free ubiquitin in proteasome granules (Gu et al. 2017). Figure 2: Model of proteasome dynamics between proliferating and quiescent yeast cells. Which structures maintain the reversibility and mobility of proteasome granules ? What is the function of proteasome granules with regard to the degradation of aberrant and toxic proteins ? What is the fate of proteasomes, if they are not stored in proteasome granules during quiescence ? Our studies in yeast will foster new ideas for understanding the biology of the quiescent state of human cells in health and disease, and how cells are protected from irreversible and immotile protein aggregates that originate from inefficient protein degradation. Our research is funded by the Canadian Foundation for Innovation, National Sciences and Engineering Research Council, and Canadian Institutes for Health Research. Gu, Z.C. & Enenkel, C.
Weberruss, M.H., Savulescu, A.F., Jando, J., Bissinger, T., Harel, A., Glickman, M.H., Enenkel, C.
Burcoglu, J., Zhao, L., Enenkel, C.
Yedidi, R.S., Fatehi, A., Enenkel, C.
Saffert, P, Enenkel, C., Wendler, P.
Yedidi, R.S., Wendler, P., Enenkel, C.
Gu, Z.C. (Jerry), Wu, E., Sailer, C., Jando, J., Styles, E., Eisenkolb, I., Kuschel, M., Bitschar, K., Wang, X., Huang, L., Vissa, A., Yip, C.M., Yedidi, R., Friesen, H., Enenkel, C.